A slow moving, weekend weather maker rolls into KAKEland Friday bringing rain, possibly severe thunderstorms and even another taste of snow. The area of low pressure will track from the Panhandle Region of Texas and Oklahoma north and east toward Kansas City through the weekend. Ahead of this rain maker, a south and easterly wind has drawn up more moisture across KAKEland. This increase in moisture created fog and light showers throughout the day. As we head into the evening hours, the rain will expand in coverage and intensity. 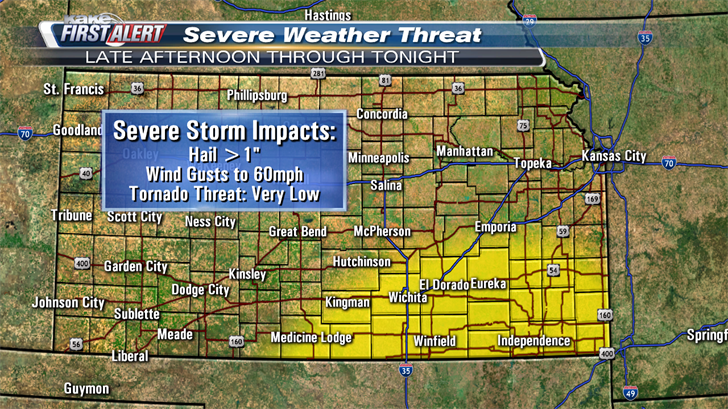 A severe storm or two cannot be ruled out in portions of South Central Kansas. If storms become severe, the main threat will be large hail over quarter size. As temperatures drop Friday night into Saturday morning, rain will change over to light snow in extreme Northwest Kansas. Coverage of this snow will be limited to north of I-70 and totals will generally be light with most spots picking up less than 2” total. Locally higher snowfall amounts to 5” will be possible closer to the Kansas-Nebraska state line. Chances of rain south of I-70 will largely diminish on Saturday with light to moderate snow and mix still possible North of I-70 through the day. 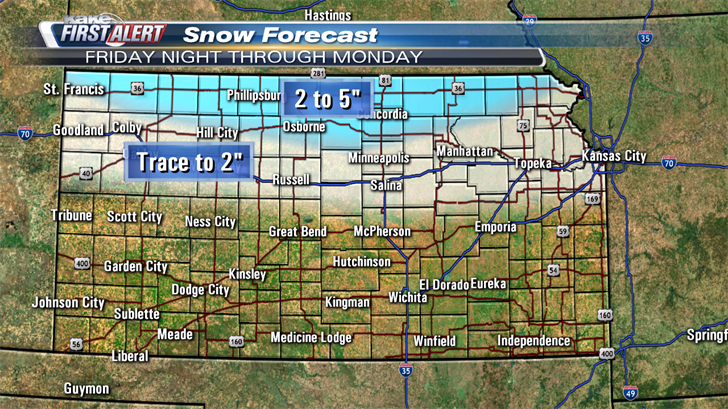 Light snow will remain possible through the day on Sunday and even into Monday across Northern KAKEland. Light snow and high wind could make travel treacherous at times, despite relatively low snow totals. At this point and time, accumulating snow is not anticipated this weekend for areas south of Interstate 70, this includes the City of Wichita.